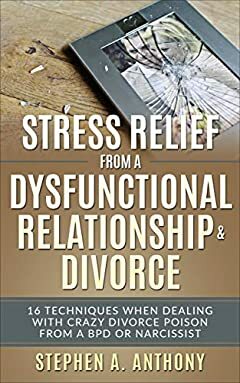 If you are struggling to maintain a ‘normal’ life while dealing with a high conflict divorce, this book will help you to reduce your stress. An ex with narcissism or borderline personality disorder will do everything to 'win' and ruin your life. You must take care of yourself during divorce recovery. Is it difficult to face the lawyers and courts, even if you are trying to protect and take care of your kids? That's what your ex wants and it can defeat anyone unless they have some control of the stress. If you've wanted to scream at the top of your lungs because you just can't take it anymore - this book is for you. Divorce can be stressful. Divorcing someone that is aggressively trying to make your life difficult is a complete nightmare. If your toxic ex is trying to 'win' and show that they are better than you, your life and health will deteriorate because of the stress. Getting out of a dysfunctional relationship is the right thing to do, just don't let it destroy you. I spent over 8 years in and out of court and battling my ex. It took its toll and I'm still trying to recover. Through this, I learned techniques to help control and reduce my stress. I was able to put up with everything my ex was throwing at me and fight back. Being able to think clearly was huge and something that she did not want - but because I learned her game and got control of my life, I couldn't be controlled and manipulated any longer. My divorce recovery was long but I was able to persevere due to the actions I took to control my stress.